Worth reading is a recent interview with Pope Francis conducted by Eugenio Scalfari of La Repubblica. Scalfari, an atheist, had written to request an interview, and was floored when the Pope himself called to schedule a time. “From my point of view, God is the light that illuminates the darkness, even if it does not dissolve it, and a spark of divine light is within each of us. In the letter I wrote to you, you will remember I said that our species will end but the light of God will not end and at that point it will invade all souls and it will all be in everyone." 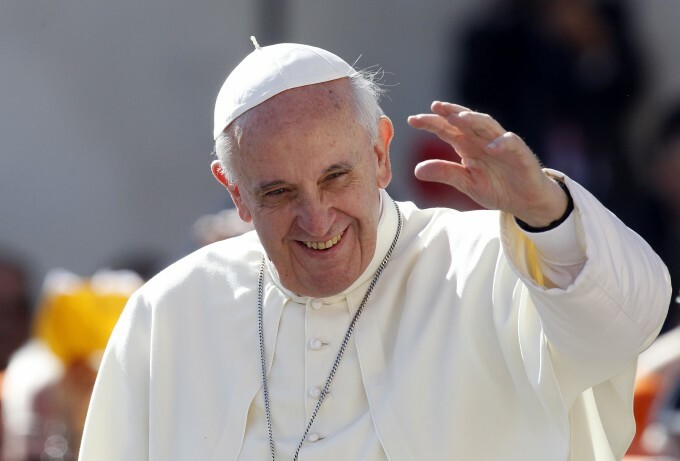 I am so impressed with this pope and his example of graciousness and openness. Well, I hate to break it to you, but the Pope is actually Catholic. It's all true. "I read your selections from the Pope’s interview, and something struck me very, very deeply about many of the passages. Pope Francis seems rather like a Quaker. First of all, he talks about God’s light being everything, in everyone, and that goodness is universal. This concept is at the core of Quaker theology. In addition, his mystical experience before accepting the papal seat seems rather like what Quakers seek, often in vain, every single Sunday. He cleared his head, calmed himself, and listened for God. In return, God filled him with a sense of purpose and holy light." Mr. Bennett, I have to say, it's a little insulting. This happens to be Catholic theology from a Catholic pope. Just because you like what he's saying and perhaps see some overlap doesn't make him "Quakerish." Do you know what I mean?